Prior to being a movie theater, the building located at 46 Bank Street was a hotel named The New England House. 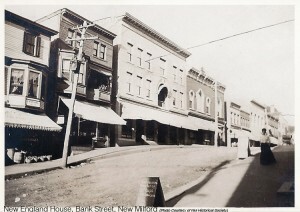 The New England House occupied the building from 1902 until 1919, when the property was sold to William G. Mock, owner of the silent movie house The Star Theater. Mock hired the design firm Buckingham & Taylor to create a new, state of the art cinema which opened in 1920. In 1937 the theater was remodeled to add much of the art deco facade that is still seen today. 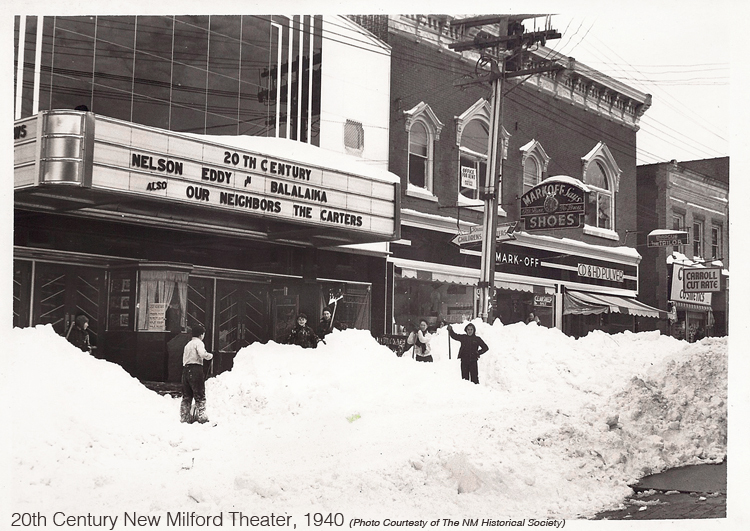 At some point during this time the theater’s name changed to The Twentieth Century New Milford Theater. 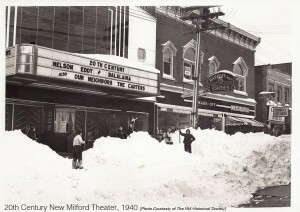 In 1950 the theater was sold to A.J. Smith, owner of Newtown’s Edmund Town Hall theater. Smith operated the theater and kept its doors open until his death in the 1960’s. The theater was purchased in 1976 by Steven Barry who reopened the business as the Bank Street Theatre. In 1982 Barry reconfigured the single auditorium into two, one seating 126 and the other 260. In 1997, the theater was again renovated, this time to three auditoriums seating approximately 120 in each. Wall surfaces and fixtures were replaced and audio systems were upgraded. The exterior had also been restored to show off its black and white Carrara glass facade. A pressed tin ceiling with soffet lights has been revealed under the marquee, most likely not seen since the 1937 renovation. Also uncovered during this round of renovations was the original terrazzo lobby floor featuring the 4-pointed star of The Star Theater. In 2005, after nearly 30 years in the business, Barry sold the Bank Street Theatre to Stamford based Garden Homes Cinemas. In mid-2007 a local Sherman resident purchased the building and established a new business, The Bank Street Theater (-er at the end!). 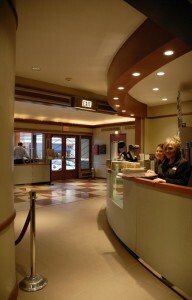 Within months of the new business being open the interior of the theater was again renovated. New restrooms were installed in the locations of the old video arcade room and old concession stand. 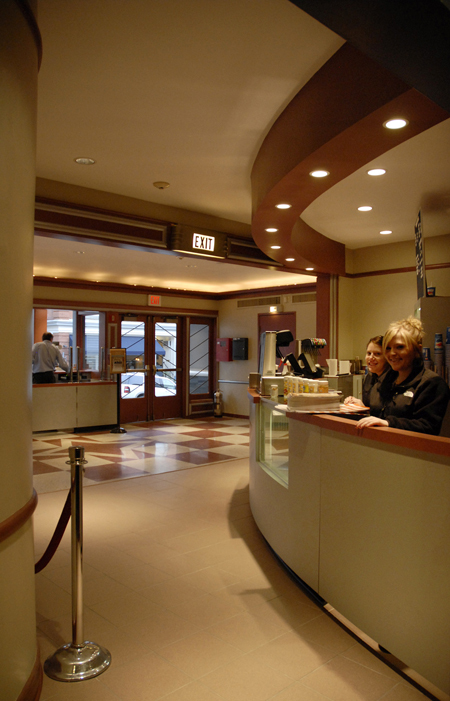 A new, larger concession stand was built in the center of the lobby. The lobby also received new paint, tile & carpeting. By mid-2008 it became clear that digital projection would eventually replace 35mm film. Theater 1 was outfitted with a new Christie digital projector and a 3D machine. 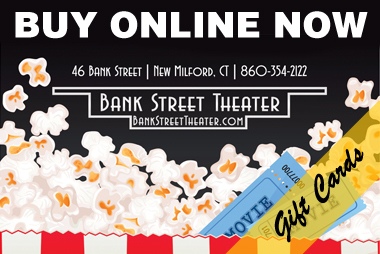 The first digital feature to play at the Bank Street Theater was “Fly Me To The Moon 3D”. Theaters 2 & 3 were soon after outfitted with new digital projectors as well. The last 35mm film to play at the Bank Street Theater was “Gran Torino” on January 26, 2009. In April 2010 a fourth screen was added in the space that originally housed a theater stage. New seats were installed in theater one in 2016. The following year all new drapery was installed in theaters two and three.